Picture taken in sunlight. This was very pigmented and applied quite well in two coats. This turned out to be another nice surprise for me; I like it so much better than I originally thought I would. It’s beautiful! 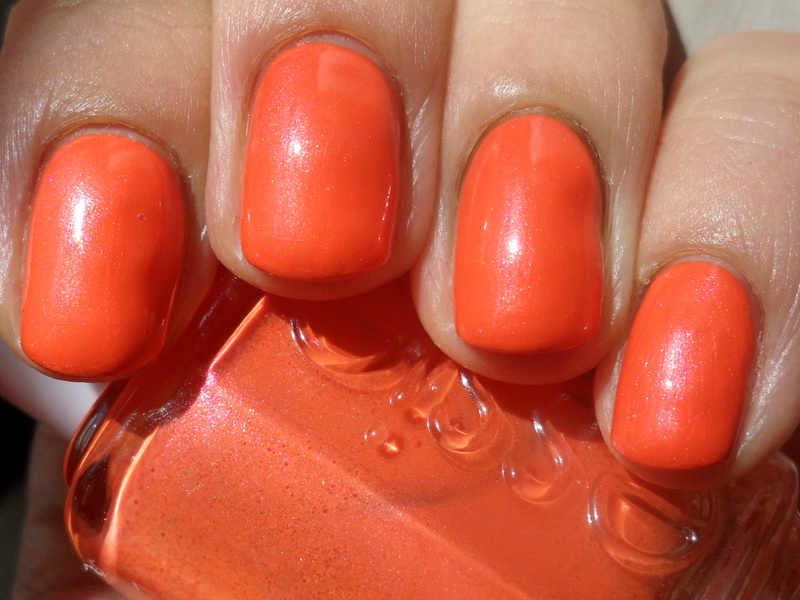 It’s not just a regular orange shimmer; it’s so much more than that. Normally I wouldn’t pair orange manis with pink pedis (and vice versa) since they’re not complementary colors, but the pink shimmer works perfectly well in this orange base, and gives the overall shade a bit of a pinky-tangerine tone. I also wasn’t expecting the finish to be so glowy! (Not in the neon kind of way, but the lit-from-within kind of way.) It makes me think of a gorgeous sunset. I paired this with Sephora by OPI Skinny Jeans on my toes.